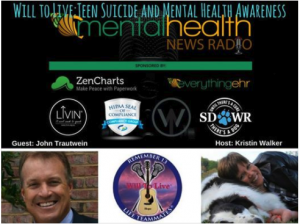 The Will To Live Foundation’s co-founder, John Trautwein was interviewed in May, 2017 by Kristin Walker, the CEO and founder of everythingEHR and MHNR Network. As host of Mental Heath News Radio, Kristin has dedicated her life to mental health! Click on the above Play button to listen to Kristin’s in-depth and personal interview with John Trautwein of Will To Live. Together they discuss ways to combat the stigma associated with Mental Illnesses in our communities! This entry was posted in WTL In The News.